Purchase this product now and earn 3,900 Reward Points! Helps with carbohydrate digestion. Similar to Zyme Prime but with added xylanase to keep stools from being too firm. New label design, same great formula! 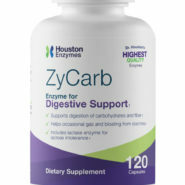 ZyCarb helps with digestion of starches, carbohydrates and sugars. The enzymes present are balanced to provide digestive relief without the overly-firming effects on stools sometimes observed with Zyme Prime. 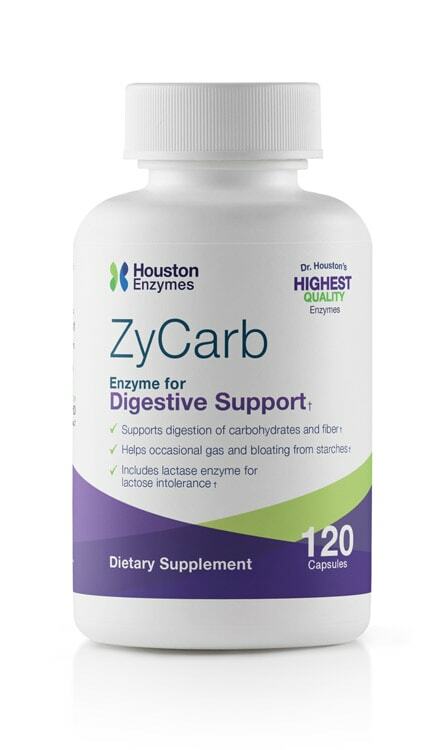 ZyCarb will help with lactose intolerance, gas, and bloating. One protease enzyme in the formula provides help with those starchy foods containing some protein, as well as helping break down glycoproteins. 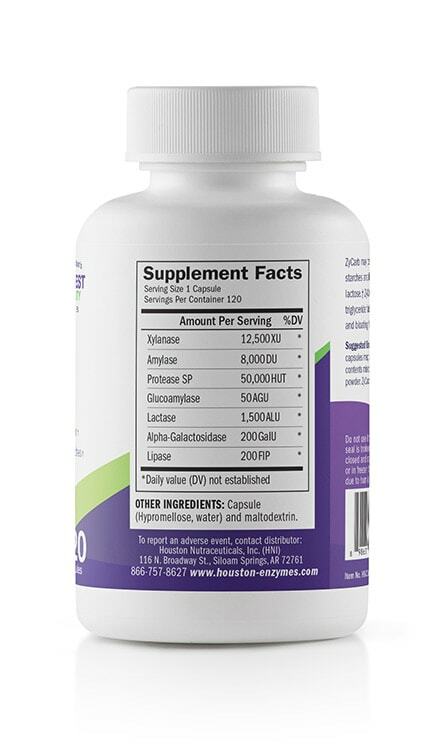 Amylase enzyme is lower (compared to Zyme Prime) which will help reduce the firming of stools. Polyphenols, or sometimes called “phenols”, are compounds found in all plants. Some people have reactions to these compounds (red cheeks or ears, rashes, shiners under eyes). Xylanase is an enzyme that breaks down xylans, compounds found in plant cell walls, and appears to allow the ingestion of polyphenolic fruits and vegetables without the aforementioned reactions; and was the basis of our No-Fenol product. The enzyme also helps stools from becoming too hard, and so counters the effect seen with other enzyme products. ZyCarb contains the xylanase equivalent of 1/2 capsule of No-Fenol. This unique combination of enzymes should provide excellent digestion of carbohydrates and sugars, but without the stool-hardening effect seen with other carbohydrase products. Galactosidase is useful in breaking down hard-to-digest carbohydrates found in legumes, and helps reduce gas produced from their fermentation in the intestine. Amylase and glucoamylase are used together to hydrolyze starchy compounds into simple sugars. Lipase is present to hydrolyze triglycerides to short-chain fatty acids. All enzymes are derived from plant-based sources. ZyCarb is helpful in easing the gas production, bloating, and cramping from such dietary problems as lactose and fatty food intolerance. This product may not be appropriate for those with known allergies to Aspergillus enzyme proteins, though non-specific mold allergies do not necessarily preclude use of fungal enzymes. Consult your medical doctor for further advice. Those with known anaphylactic allergic reactions to fungal proteins should NOT ingest fungal-derived enzymes. Other Ingredients: Capsule (Hypromellose, water), maltodextrin.No added sugar, starch, dairy, soy, wheat, yeast, gluten, nuts, artificial flavors, or animal derivatives. 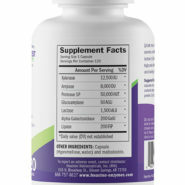 Recommended dosing is 1 or 2 capsules per meal, however; more may be taken if needed. Dosing is based on amount of food ingested, not body weight or age. No upper limit has been established for oral enzyme supplementation. Animal studies indicate that extremely large doses of plant enzymes may be ingested without toxicity or ill effect. Feel free to vary the dosage of ZyCarb based on type and size of meal. Those meals higher in carbohydrates and/or fats may call for higher doses of ZyCarb.